John Constantine is a quite popular anti-hero whose first appearances were in dark Vertigo comic books. He first appeared in “The Saga of Swamp Thing” #25 (1984) and he was created by Alan Moore, Steve Bissette, John Totleben, Jamie Delano and John Ridgway. Later, he was given his own comic book series titled “Hellblazer” (1988–2013), which was the longest-running and perhaps most successful series to be published by Vertigo. It was a sort of horror series in which his role was the working class, occult detective who dealt with his demons while trying to do some good by dealing with more evil forces. 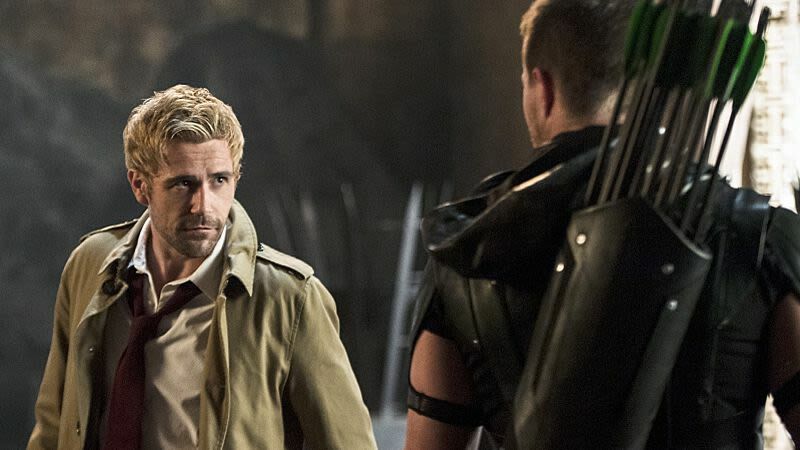 After other superb comic runs, John Constantine finally had his first movie (in which he was portrayed by Keanu Reeves) and tv series (in which he was portrayed by Matt Ryan, who's sometimes considered to be the real life Constantine) which was, sadly, cancelled. He then had a leading role in the New 52 “Justice League Dark” title, in which (besides being an exorcist) he was a magician. Recently he has been appearing on the DCTV shows “DC’s Legends Of Tomorrow” and previously on “Arrow”, where he was still astonishingly portrayed by Matt Ryan. Even though his tv series didn't make it to a second season, he still remains popular and loved among comic readers. John Constantine was born in Liverpool, Lancashire. His mother died giving birth to him, and in the womb, John strangled his twin brother by using his own umbilical cord. His father always blamed his wife’s death on John, causing the two of them to never get along. Since their father became an alcoholic and was imprisoned, John and his older sister spent their childhood with their aunt and uncle and only went back to Liverpool when their father was released. John’s ancestry were the “Laughing Magicians”, infamous mages who were notorious for using their power to bluff the gods; thanks to this bloodline John started practicing magic. He is a tragic character and basically an example of what you never should do if you want to be a decent person. So why is he an anti-hero and not a villain? The line that separates these two sides, when it comes to Constantine, is very thin. He was born in a tragedy that darkened his soul, but yet he is motivated by a profound will to do something good in his life. He doesn't always succeed in doing the latter, because, although he actually tries to be on the right side and he sorrows at seeing people get hurt, John still remains selfish and ruthlessly cunning and nothing motivates him more than saving his own life and soul. That also explains why anybody --or almost-- who knows him would be scared by working with him or why he cannot have a healthy and a working relationship (with Zatanna, for instance): his behaviour caused harm to a lot of people (many of his ‘partners’ didn’t survive, reason why he doesn't have much friends besides Chas). That's what makes him dangerous and that's also why not even the Justice League trusts him completely (it was stated in the “Hellblazer Rebirth” series quite recently). His characterization is quite particular: deadpan, continuous snarking (which can actually be quite funny) and most incisive is his cynicism. He's always pictured with a cigarette in his mouth, which --besides being just another bad habit and flaw of his- might represent his tendency to self-consumption and bane he had had since his birth. He does feel guilty about his terrible actions, but on the other hand he sees what he does as an appropriate response to a ruthless and cruel world, which you cannot survive without being just as pitiless. That’s why he's such an interesting and conflictual character! And he's even more inspiring because in spite of his bad tendencies, he is always on the good side trying to fix things. Regardless of whether he succeeds at the end or not, he tries. That, summed up, is why he is considered to be such a good character. Hopefully we get more of him in the future, for example in a “Justice League Dark” movie -- confirmed to be one of DCEU’s next projects. Fans can't wait to see to see the welsh mage on the big screen again.